In the past the Kingdom Hearts III discussion has been scattered across this forum. This thread will act as a place to focus all information to do with with all things Kingdom Hearts III going into the future. Right now this OP is bare, but at a later time it'll be updated to be as current with information as possible. Nomura (Lead Director of KHIII) attends as a quest at Magic (Monaco Anime Game Conference) where he gave the world a new screenshot of Kingdom Hearts III and Final Fantasy VII Remake. 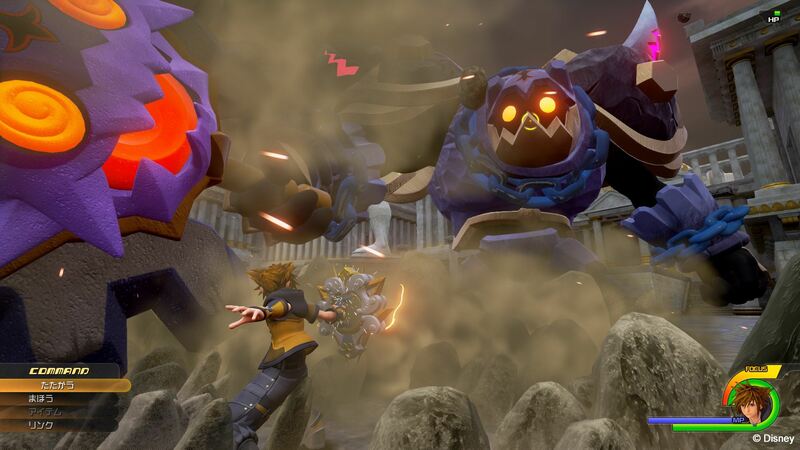 In the new screenshot we can see a brand new heartless enemy, and Sora now in his new Shield Drive Form. The original image we had of this was taken second hand by a phone, but later Nomura did finally upload a direct feed of the screenshot. While also revealed the area Sora and the Heartless are fighting in is Thebes, the Greek city that the animated Disney movie Hercules takes place in. So this now confirms that in one world we have; Mount Olympus, Olympus Heavens, Thebes, Olympus Colosseum (Possibly). This is a huge world! I've never played Kingdom Hearts, but it's clearly a much loved series and there has to be a reason. Sadly, I'm a lazy basterd and can't be bothered to play the old games on the old systems and would rather play a re-master or something. So, and I admit this might make me look really stupid and I apologise in advance for that, but can I play the current PS4 titles like 2.8 (A little criticism, the game titles do not make this easier at all) and "get it"? You can't play 2.8 alone and expect to understand the entire plot. What you can do though, is wait for the KH1.5 & 2.5 Collection on PS4 to release March 31st (It's £35 on Amazon) and play those before 2.8, so you can play them canonically. At that point if you feel like you are into the series and want to know what happens afterward than pick up 2.8. Which include 2 games that take place right before Kingdom Hearts 3, and a movie detailing the events on how all this started. And warning, no matter how many times they answer a question, there are more questions left. When it comes to Kingdom Hearts 3 though I have not seen much of since about 2 E3's ago. At least I think it was then. I've never played Birth By Sleep so I'm kinda obligated to buy this collection now. How much is 2.8 by the way? 50 dollars for what amounts to a Kingdom Hearts 3 teaser is a bit much. It's 50 dollars for Limited Edition (which gets you a pin) and 45 dollars for Standard Edition, which is the game. These prices are based on Amazon and might be sale prices. 2.8 gets you a full fledged remastered KH game from the 3DS, a 2-3 hour prologue for KH3 with 0.2, and a 2 hour-ish movie with Back Cover. Honest I would wait for a price drop of 40 dollars or below. Probably going to get it though I'll probably start with Birth by Sleep since I never really got into it even with the other remasters on PS3. Finally we get new game play plus a release window. Only took Nomura being removed as lead. That's not me being dismissive of his design but this is the second time this has happen. I wonder if now FF7 remake will have a release window in the next one to two years? Biggest thing to take from it is that unlike previous worlds where you know Sora and the gang gets placed in and for the most part follow the story we already know, Pixar asked them to make something original for a story for the Toy Story world, so whatever story we are getting, it apparently takes place after Toy Story 2.